On 6 August 2018 at Parliament House I presented certificates to the students from Monash University and The University of Melbourne who participated in the 2018 Parliamentary Internship Program. 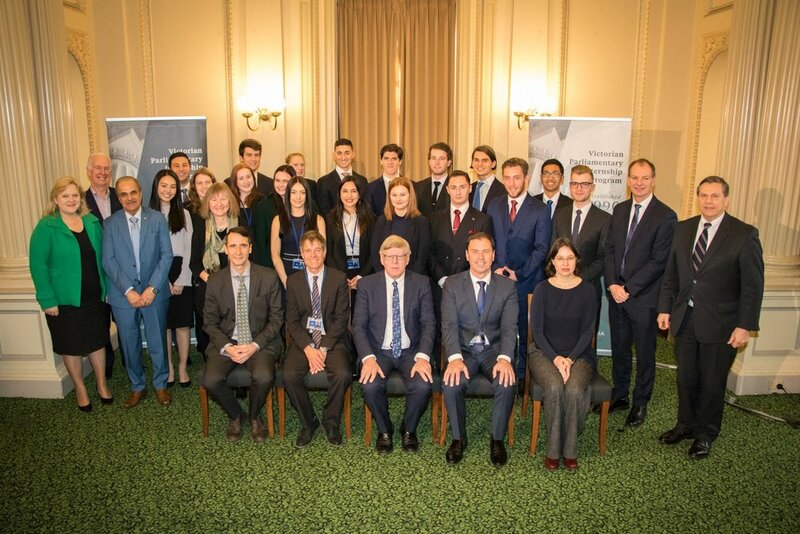 The Victorian Parliamentary Internship Program commenced in 1990, taking 21 students on board. Since then the program has hosted over 1000 interns who receive an accredited semester unit of study from their university after completing the internship. As part of the program students are paired with a Member of Parliament with common research interests, areas of academic expertise, relevant political affiliation and geographical location. Students are required to compile a research report on a topic established in consultation with their Member of Parliament. An impressive array of internship alumni has emerged domestically and internationally, with graduates from the program establishing careers as Members of Parliament, Clerks of the Parliament, Parliamentary Officers, committee staff, journalists and newspaper editors. Thomas Duke from The University of Melbourne and Emily Tang from Monash University were awarded the Presiding Officers' Prize for most outstanding internship reports in 2018. Thomas prepared a report for David Southwick MP on artificial intelligence policy in Victoria and Emily prepared a report for Margaret Fitzherbert MLC on creating safer rooming houses. Congratulations to all the interns!